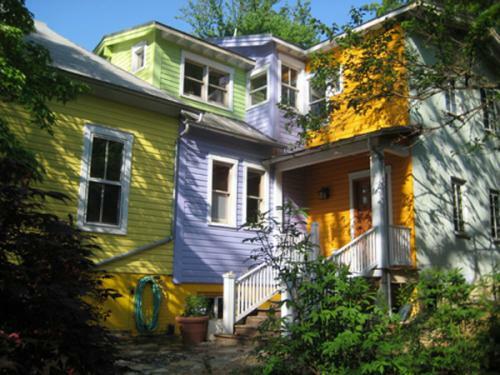 From the front, Bill Hutchins’ small bungalow looks much like the rest on his street in Takoma Park, MD. 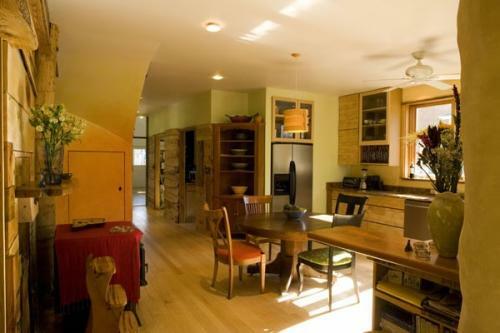 But the 2,100 sq.-foot house Hutchins shares with his wife and their three children (with an apartment that they rent in the basement) is a green home, built with eco-friendly features and with environmentally low-impact practices that limit toxins and waste. To Hutchins, homes have the potential to have soul, especially when they’re designed and built thoughtfully and with heart. He knows because he’s both homeowner and architect, and he is also the owner of Helicon Works Architects. Hutchins incorporated elements in designing his home that have been available to consumers for years. Yet, it feels so different from a conventionally built home that it’s clear green is still on the cutting edge. Below, watch associate editor Eleanor Greene go on a tour of the house with Bill.Or watch on Facebook. The book, which he published through Washington, DC, bookstore Politics & Prose, is a collection of poems, short essays, and photos that touch on connections between people and the Earth, and people and their homes, while also exploring how people may find home inside themselves. In coordination with the book's release, Hutchins launched Dwelling events and workshops out of his home. The workshops, the first of which took place in May, help people reassess their connections with their homes, forge better relationships with them, and live mindfully. Even before his daughter inspired him to reenergize the creative aspect of his work, he says he was always a green-minded person and architect. He grew up “playing in the dirt,” literally and figuratively, and has long been aware of being Earth-minded in his life. When he started his practice, he incorporated new green principles as he discovered them, such as eliminating toxic formaldehyde and placing a priority on sustainably sourced wood. The tiled stones on the walkway are courtertop fragments, flipped upside down, which he salvaged during a dumpster dive. The pavers in the mudroom and the back terrace are from Community Forklift, a nonprofit that sells surplus, gently used, and salvaged supplies for home improvement. Even on a frigid day, the house is warm, thanks to the corn-fired stove in the corner of the kitchen, the room at the center of the house. Using corn is cheaper than heating with oil and produces fewer greenhouse gas emissions. Every couple of weeks, Hutchins or his wife gets organic, locally sourced corn, purchased through a cooperative, for the stove from a pickup point. The stove uses about a bucket of corn per day in the winter. The kitchen counter is splashed with color from salvaged mismatched tiles, and in the mudroom, closet doors came vintage from the Pentagon through Community Forklift. Buying salvaged materials saves money, and it also saves resources, compared to buying new doors or a slab of quarried marble for countertops. The cabinet doors have a unique, sculptural look, which Hutchins said was achieved by cutting two-by-fours into wavy patterns, sanding them down, and nailing them together. Because they’re made from whole pieces of wood, not compressed fibers, they’re quite sturdy. The Hutchins’ addition to the historical part of the house included a kitchen and sunroom downstairs, and two bedrooms and a porch upstairs. But the walls on the addition aren’t made of drywall—they were built using straw bale construction, a method that involves stacking up bales of straw and plastering it inside and out to protect it from the elements. The processes of growing hay for straw and of making plaster are far less energy-intensive than acquiring resources for other building methods, and neither requires toxic materials. A straw bale wall can last just as long as conventionally built one and provides insulation at a lower price. The result of the straw bale construction looks more earthy than conventional construction, especially in Hutchins’ house, which volunteers helped build in exchange for lessons on green building practices. The plastering isn’t perfectly flat, giving the walls a lively texture and unique style. collaborative. 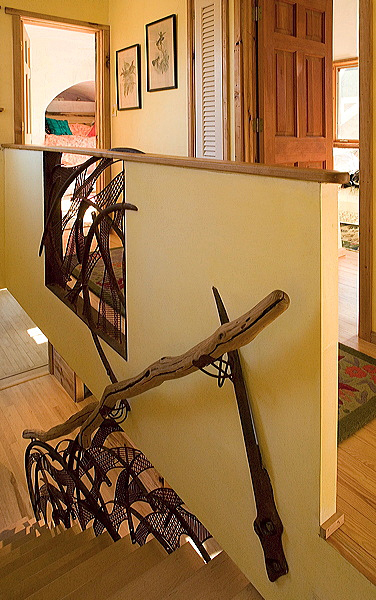 Using sketches from Hutchins and salvaged metals, the company created an artistic railing and door handles in Hutchins’ home without the impact of new metals. Rain barrels in the backyard collect runoff for use in the garden. A collection pond captures water that would normally run downhill and pool in the basement, turning it into a habitat for birds and other animals. There are areas in Hutchins’ home that he’d like to make even more eco-friendly. He’d love to upgrade the front windows to better insulate the house, but he can’t because of the historic neighborhood’s rules. The rest of the windows, however, are salvaged from builders who bought too many and would have wasted them otherwise. Using “orphaned windows” saved Hutchins about $12,000. Rooftop solar panels fulfill about 15 percent of the house’s electricity needs. And overall, he’s done what he can to make the home energy efficient. He notes that his house is very well insulated. In fact, that’s the green quality that has saved him the most money. The EPA estimates a well-sealed home with good insulation can save homeowners 15 percent on heating and cooling costs, but Hutchins admits he hasn’t really kept track of exactly how much he’s been able to cut down on his energy bills. He just does what he believes is the right thing to do. Though Hutchins’ home is what most would consider to be green, he emphasizes it’s far from perfect. Getting to green is a journey, he says.